The big question facing Sri Lankan cricket at the moment is what after world’s highest wicket taker Muttiah Muralitharan retires from the game. The ace-spinner has indicated that he will be retiring from the game in November next year. Although Muralitharan hasn’t spoken on what he intends to do in post retirement, he gave an hint that coaching maybe an option when he conducted a coaching clinic in Trincomalee on Friday to young spinners of the area. The arrival of country’s favourite cricket son to Ehambaram Stadium in Trincomalee attracted huge number of cricket enthusiasts who have been able to only follow him in television. Muralitharan flanked by his childhood coach Sunil Fernando and team-mate at St. Anthony’s College, Piyal Wijetunga, the current spin bowling coach at Sri Lanka Cricket, mixed with the locals freely while speaking to the young bowlers on spin bowling and searching for talent. Around 150 cricketers had come in for the session conducted by the bowler with the support of his sponsors Ceylinco Life. Deputy Chairman of Ceylinco Life R. Renganathan, and Samitha Hemachandra, Deputy General Manager of Ceylinco Life were present at the occasion. "Trincomalee has talent but they have gone backwards due to the problems that we had during last few years. 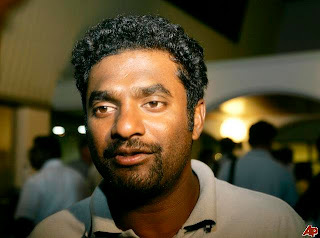 But if companies like Ceylinco can come forward for the development of the game, we can see more talents coming through," Muralitharan, who is a Brand Ambassador of Ceylinco Life told journalists.